Every Sunday, the Kosorog family follows the same routine that takes them to Arrowhead Stadium. KANSAS CITY, Mo. — Every Sunday, the Kosorog family follows a routine. They put on their red Kansas City Chiefs jerseys and start making their way to Arrowhead. At first, they would bring meatball sandwiches. Now, they bring more food to tailgate. The Chiefs are more than a football team for the Kosorogs. Sundays are much more than a football game. "We used to go to the games and it cost us 50 cents to get in. That would put us in the end zone," said Richard Kosorog. "It was amazing to see professional football in person." Kosorog became a season-ticket holder in 1966. 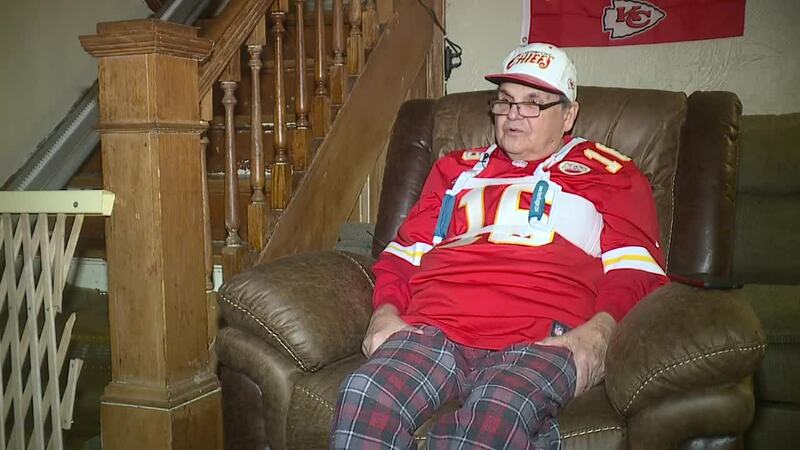 He remembers watching the Chiefs win their first Super Bowl in January in 1970. Rarely did he miss a game, eventually taking his son to watch with him. "I started going with dad in 1980," said Rich Kosorog, Jr. Together the father-son duo watched the Chiefs win and lose. Eventually, Kosorog's grandson became old enough to go to the games. "Every single week no matter how many times I have gone, I get the same kind of overwhelming feeling of happiness that we get to watch something that we love with the people we love," said Bobby Kosorog. Bobby has a son on the way. He too hopes he can do what his father and grandfather did—take his son to many games to come. "I hope when it comes my time to hold the tickets, I'll get to take him to his first Chiefs game," he said.